In the first of our three-part climate investigation, we showed why you don’t need to go far north to see evidence of climate change—it’s happening even in Florida. But if you do go north, you may soon rub elbows with oil companies. For years, climate change skeptics in Congress and energy lobbyists like the American Petroleum Institute (API) and the American Coal Council (ACC) have been successfully blocking significant action in the US on reducing this country’s emissions of carbon into the air. But as the ice melts up north, some of these same industry skeptics are moving to profit from it. 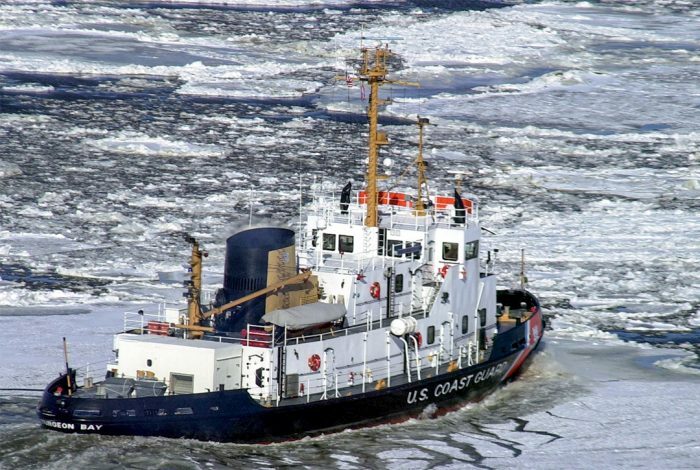 Recognizing the truth of Admiral Papp’s statement, the Navy is gearing up for an ice-free Arctic Ocean in the summer months as soon as 2016—84 years ahead of conventional model projections. This estimate is the result of an ongoing US Department of Energy-backed research project led by a US Navy scientist at the US Naval Postgraduate School‘s Department of Oceanography, Professor Wieslaw Maslowsky. Even with the later predicted ice-free date, this is pretty unambiguous stuff, and yet, incredibly, the Republican majority on the House Armed Services Committee is stacked with people who are climate change deniers. That includes the committee chair, Rep. Howard “Buck” McKeon (R-CA), who scored a 3 out of 100 on the League of Conservation Voters Environmental Scorecard (his lifetime record is 8). In 2011, even as the nation’s midsection and its “salad bowl” in Central California were beginning to suffer an epic drought that scientists link to climate change, McKeon introduced an amendment to bar the Agriculture Department from implementing a climate change adaptation plan. McKeon also voted against a bill that would have allowed the Environmental Protection Agency to enforce limits on greenhouse gasses by utilities. WhoWhatWhy’s efforts to speak with McKeon or one of his staffers on the Armed Services Committee have been ignored. But McKeon is hardly alone. It has been 24 years now, almost a quarter century, since the first International Panel on Climate Change (IPCC) issued its report warning that human activity, and in particular the burning of fossil fuels, was dangerously heating up the planet. Since that time, the US government has done little to slow the growth of the nation’s carbon emissions, and has consistently played an active role in blocking international agreement on measures to slow global warming. President Obama, who promised shortly after winning election in 2008 to begin a “new chapter” on climate change, has done little, even early in his first term, when Democrats controlled both houses of Congress. Behind Washington’s appalling record of inaction lies the politically powerful fossil fuel industry, which has spent hundreds of millions of dollars on campaign contributions and lobbying over the last two decades in an effort to block any limits on carbon emissions. In the 2012 election cycle alone the industry spent over $153 million on TV ads promoting less regulation, and more oil, gas and coal production. Not surprisingly, the president and Congress have done little over this time to limit fossil fuel use in the US, and the results have been predictable: between 1990 and 2011, US carbon emissions were up 8 percent (the number would have been higher but for the prolonged and ongoing economic slump, which has reduced economic activity, driving miles and air miles flown and electricity use and thus carbon emissions. Still, the US remains far and away the largest producer of greenhouse gasses after China, and the largest producer by far on a per capita basis: 16.4 tons per person for the US in 2012 compared to 7.1 tons for China, 12.4 tons for Russia, 10.4 tons for Japan, and 9.7 tons for Germany. The global average that year was just 4.9 tons, and the only country exceeding the US in carbon use per capita was Australia at 18.0 tons per person. Meanwhile, as the Navy plans for an expanded role in an ice-free far north, oil companies, including ExxonMobil, ARCO, Chevron, BP, Norway’s Statoil, Russia’s Gazprom, and Shell, are gearing up to begin drilling for oil and gas in parts of the Arctic Ocean that are already becoming free of ice in summer months. These major players know that even in winter, the returned ice sheet will be manageably thin in coming years. They are also even covetously looking to drill in the soon to be ice-free parts of Greenland. 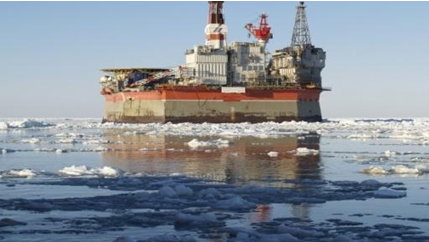 In other words, oil company scientists are on one hand assuring them there’s big money to be made tapping the vast oil and gas reserves known to lie beneath the shallow Arctic waters now being relieved of their ice cover for the first time in millions of years. On the other hand, these same companies are simultaneously lobbying Congress to sow doubts among the public about the true impact of climate-change situation. As for the public sector, how can Congress and the Obama administration, who know that the Navy is gearing up to patrol and defend a whole new coastline and vast new stretches of heretofore inaccessible territorial waters north of Alaska, keep failing to adopt even minimal efforts to slow climate change by working to limit the burning of fossil fuels in the US? Meanwhile, the American Petroleum Institute announced that same day that it was launching an ad and lobbying campaign to promote increased gas and oil exploration in the US. A report by the API, called “The State of America’s Energy: America’s Energy, America’s Choice,” pointedly notes that Alaska’s outer continental shelf–increasingly ice free and presumably accessible to drilling–contains an estimated 26 billion barrels of oil, but that at this point most of it is not being made available to energy companies for drilling. When I replied, “Well, I think it was mostly because of reduced economic activity from the long recession, right?” I was met with silence. The reality, as the Pentagon and oil industry executives know, is that climate change is progressing with frightening rapidity—and if the Arctic ice sheet vanishes in summer, with that vast reflective whiteness replaced by dark, solar energy-absorbing water, that pace will increase dramatically. The reality, too, is that sea levels along parts of the Atlantic seaboard have risen significantly since the 1930s, forcing places like Miami Beach to engage in costly major projects to stave off their inevitable future as new Atlantises. According to one expert at the University of Florida, Prof. Harold Wanless, increasingly rapid ice melting on Greenland’s two-mile-thick ice sheet, and evidence that the much larger West Antarctic ice sheet is beginning to melt, could mean a devastating 15-foot global sea rise by as early as 2100, instead of the 3-6 foot predictions that are more commonly cited (bad as those would be). This may all be perceived as great news for a water-enamored Navy, but for the rest of us, especially the hundreds of millions who live near coastlines, it’s nothing less than catastrophic. Coming soon in our series: Washington’s weird way of sidestepping the causes of climate change.